A new don is born and he vows to reinvent the bloody ‘Bang-Bang’ business of the underworld. Watching Satya 2 is like being bludgeoned. I say, stay at home and revisit the original. Most of us remember Satya (1998) fondly. 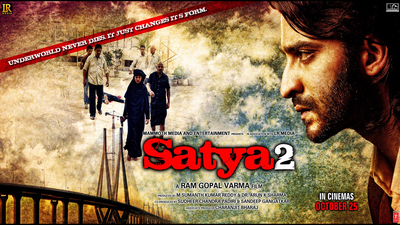 This time RGV has massacred his own best film Satya with a horrendous sequel in the form of Satya 2. Satya defined a Bollywood genre and earned instant cult following. Fifteen years on, Satya 2 defies all logic. Watching Satya 2 is like being bludgeoned. It’s morally specious and unintentionally comical. While the men kill and glower, the women serve tea and flash skin. I say, stay at home and revisit the original, writes Anupama Chopra. Ram Gopal Verma has long since been experimenting with middlebudget movies( Not a love story, Phoonk, Raktacharitra etc) and this time round he does one better(in a sense) by taking in an entire cast of unknowns and framing an underworld story around them. Sadly, today he is not even a shadow of the director he used to be. Satya 2 may not be appealing if looked at from the1998 Satya point of view, but it does well for itself as a film. RGV left his end with a hint of a Satya 3, however time will tell if that is going to make its way or not! It underlines the lowest phase of a filmmaker who, it once seemed, would reinvent Hindi mainstream for good. Siva 2-006, now it’s Satya 2-103!! Featuring Puneet Singh Ratn, Anaika Soti and Mahesh Thakur in the leads, Satya 2 was said to be exploring a new kind of underworld which Varma believes can spring up anytime. But, did the film really succeed to explore any such kind of future underworld? Random acts, Ram Gopal Varma style! Satya 2 is sheer torture! Satya 2 is not a worthy successor of its predecessor. One of the worst works of Ram Gopal Varma. It is hard to believe that RGV chose to make a sequel to his most iconic creation as both the films, Satya and Satya 2 have nothing in common, writes Paloma Sharma. Catching the earliest show in a near-vacant auditorium, in which I was the only woman, I can vouch that nobody was a wee bit enthralled. To expect Ram Gopal Varma’s “Satya 2” to be even half as good as the original is unfair, given the filmmaker’s recent work, but even Varma’s staunchest supporters would find it difficult to defend his latest atrocity of a film.